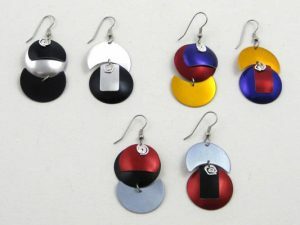 Asymmetric earrings 1 ¾” long in 4 colors, shown in Memphis (left) and Bazoche. Asymmetric earrings in 3 colors with silver detail 1 ½” long, shown in Black/Silver (left), Hot (right) and Vesuvio. 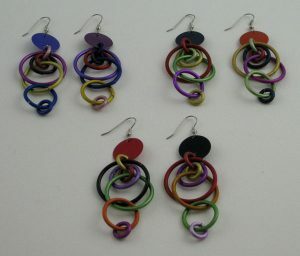 Multi hoop earrings in 8 colors arranged differently on each side 2 ¾” long, shown in Memphis (left), Tlascoco (right) and Caribbean.